NEW ARRIVAL There's something very special about Avalon’s rebranded guitars, maybe it's the thicker than usual top, the unique bracing, the stronger neck join making alternative tunings a joy….. I just know that when I pick up a new Avalon I know I'm about to play something inspiring. They resonate like no other modern guitar make that I know, and this A2-20 is no exception, with an Alaskan Spruce top and Rosewood back and sides, you start playing and superlatives just come to mind. It is somehow bright and mellow at the same time, delivering a beautiful balanced tone, with a very rich bass, yet detailed mids and trebles, and is equally happy being fingerpicked or strummed. It’s unusual for a new guitar to have a mature sound, but this one has, it really is something quite special. It comes in a Hiscox hard case. NEW ARRIVAL Don’t be fooled by the price, 60’s Stellas are fantastic blues machines, especially for Delta blues and slide guitar. These models featured solid soundboards made from slab-sawn Birch and feature ladder bracing, and this is the secret to Stella’s midrange blues tone: Every sound-searching guitarist should own at least one old Stella. Don’t expect a high end snap like a Martin, Stellas honk and growl like the sound from an old 78 record. These guitars were made in the Harmony factory in Chicago and feature poplar necks with a non-adjustable steel reinforced neck. This particular example was beautifully restored by Knight Guitars of Surrey, and the guitar plays like a modern guitar, but with vintage feel and vibe. 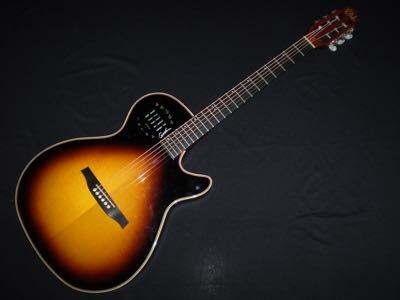 NEW ARRIVAL This all-solid archtop acoustic from Loar honours the pioneering jazz guitars of the early 20th century. 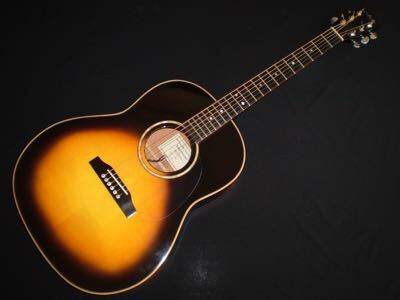 This accurate replica features a solid Spruce top with solid flamed Maple back and sides, two parallel tone bars, a trapeze-style tailpiece and an adjustable ebony bridge. The guitar produces a warn and vibrant tone at a price unmatched by any other archtop, and has an excellent combination of tonal quality and carrying power. Designed by Greg Rich and inspired by the man who pioneered jazz guitars - Lloyd Loar - these guitars hark back to the golden age of archtops, but with modern build techniques, and an affordable price. This example is in excellent condition, with just a few signs of light playwear. NEW ARRIVAL This ex demo Avalon L2 20 is one of the most impressive new guitars I've played in quite a while. The Alaskan Spruce top, coupled with Rosewood back and sides deliver clarity and sustain in equal measures. It works very well with fingerstyle play, well balanced and articulate, but also for strumming where the body size allows the air to move creating a big, dominant sound that never gets away from you, and when soloing the smoothness and clarity of single notes is very impressive. The guitar feels quite substantial and road ready, yet it’s the subtlety that’s surprising. It comes in a Hiscox hard case. 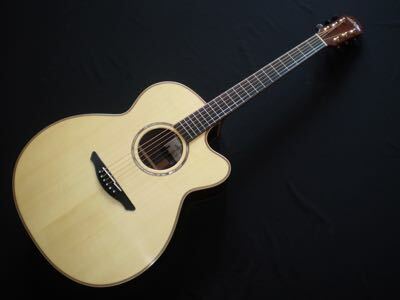 NEW ARRIVAL Bourgeois are one of the best high end acoustic guitar builders in the US, producing genuinely hand made guitars from Maine, New England. This very early example is a real rarity, the serial number being 000150, making it from only the second year of guitars Dana Bourgeois produced. Simply called ‘Dreadnought’ on the label, it has a similar body shape as his famous ’Slop D’ series. 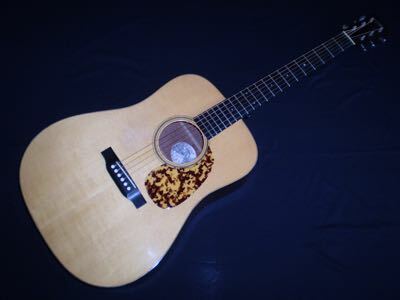 It features an Adirondack Spruce top, with Honduras Mahogany back and sides, and Rosewood fingerboard and bridge. There are a some classy touches such as the fully bound fingerboard, Abalone rosette and very striking back seam. He’s kept the visuals classic, and the tone is something else - it has incredible presence and bass response, yet retains a good balance with strong midrange and bright powerful trebles. It’s very responsive for fingerstyle playing as well as powerful rhythm bass lines. The guitar’s in excellent condition, with great playability, and comes in it's original hard case. NEW ARRIVAL Not just a smaller version of the OM, the Collings Baby 2H is a specialised instrument in itself. The 14-fret body and 24 1/8 inch string length tunes to pitch at lower string tension, making the action more supple while requiring less of a stretch between frets. The size and voicing give it an exceptionally balanced EQ with a wonderful complex tone and remarkable projection. Featuring a Sitka Spruce top coupled with Indian Rosewood back and sides, Ebony fingerboard and bridge, a modified V Mahogany neck, Pre-war scalloped X-bracing, Herringbone trim and diamond inlays, this guitar looks as classy as it sounds. It looks like a travel guitar, but is perfect for stage or studio, it's seriously one of the best modern guitars of it’s type you will ever play. It's in excellent condition, and comes in a deluxe hard case. 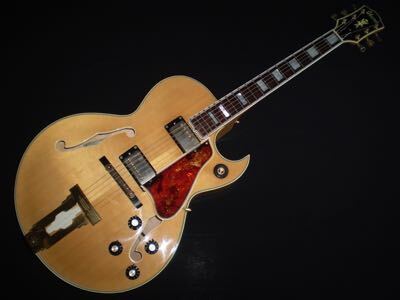 NEW ARRIVAL In the early 70's, Ibanez set out to make high-precision replicas of Gibson's top-end instruments. These copies were so good that Gibson sued to stop production. Known as 'lawsuit' models, these guitars are now coveted for their quality and faithfulness to the originals. 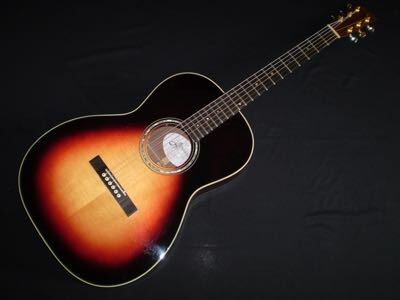 This model, the 2455, is a copy of the classic Gibson L-4 CES. This gorgeous guitar sports a pair of Super 70’s humbuckers, gold hardwear contrasting beautifully with the dark honey coloured finish, really distinctive Abalone inlayed headstock and fingerboard, and multiple binding on the body, neck and headstock. Plugged in it will take you from the smoothest jazz tones and the deepest blues, through to swing, rock ’n’ roll, and everything in between - a truly versatile guitar. The guitar is in excellent, all original condition, and comes in an upgraded flight case. NEW ARRIVAL Taylor have become well known for making the industry standard, stage performance electro acoustic guitar, and this 410CE model is a fine example. The Spruce top and beautifully figured Ovankol back and sides give the guitar a bright, airy feel, and the body size gives great depth and punch. It has the famous expression pickup system, which gives you the versatility of blending between undersaddle pickup and body sensors. 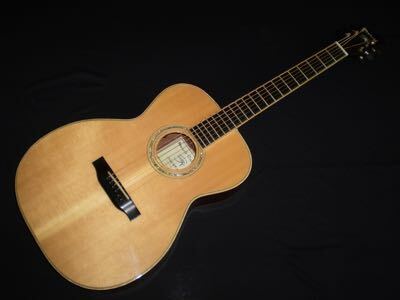 The guitar looks stunning, is in excellent condition, with just a few light marks, and plays very easily with a comfortable neck and great action. It comes in it’s original hard case. NEW ARRIVAL K Yairi was a master luthier, and believed that the most laborious methods of wood selection, preparation and manual carving were central to creating the ideal sound. With a small team of highly trained luthiers, his guitars are of the finest quality in build, feel and tone. This example is an OM size featuring all solid wood construction. It has a Spruce top with Rosewood back and sides, there’s a bound Rosewood fingerboard with beautiful Abalone snowflake inlays, an Ebony bridge, Abalone rosette, bone nut and saddle, gold tuners and a really striking Ebony headstock with Abalone inlays. Tonally it’s very crisp and articulate, beautifully balanced with good projection. The guitar has great definition and clarity for fingerpicking, and works well for strumming. 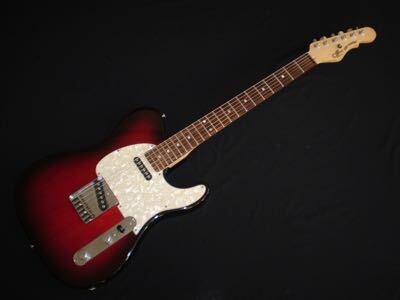 It’s in excellent condition, the neck feels great and the action is very comfortable. The guitar has an Alvarez 600T MkII pickup system installed, and comes in a non original hard case. NEW ARRIVAL The Collings D1AV is extraordinarily loud. The Adirondack Spruce top favors a strong pick attack and provides the ample headroom and power needed to cut through bluegrass ensembles. The Mahogany back and sides keep your lead lines clear and distinct. Volume aside, this guitar is also incredibly balanced in it’s frequency response. Notes are rich and full all the way up and down the neck. The midrange and high-end sparkle will cut through any studio or on-stage mix with ease. The lows are balanced, defined, well rounded, and never boomy. Collings Vintage Now neck is the perfect compromise for many players that think a modern neck is too flat in profile, yet the typical neck on a 40’s style instrument is too thick. Collings’ exclusive neck profile is uniquely adapted to players looking for vintage width and girth, with contemporary playability. The slightly wider string spacing at both ends of the guitar also makes fingerstyle playing and chordal accompaniment more enjoyable. The guitar is in good but well played condition, with a fair amount of visible playwear on the top. Those 16 years of play have really opened the tone up, and it sounds far more mature than it’s years would suggest. It’s a truly exceptional instrument. The guitar has an underside pickup fitted and comes in a brand new hard case. NEW ARRIVAL This very special Historic Series guitar is a loving recreation of Tony Rice’s infamous D28, a guitar previously owned by Clarence White, hence its name – The White Rice. 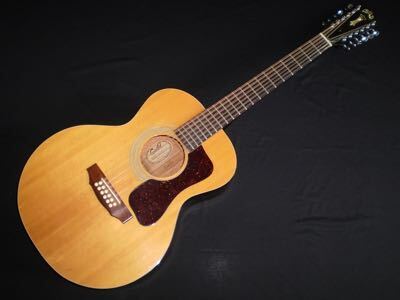 With its instantly recognisable enlarged soundhole and overhanging fretboard, the original guitar is generally agreed to be one of the best sounding D28’s in existence. This guitar features a torrefied Sitka Spruce top and Indian Rosewood back and sides finished in aged nitrocellulose lacquer. Thanks in part to the oversized soundhole, the White Rice combines incredible power with an openness and resonance that is unique. Accurate to the original, this is the ultimate White/Rice tribute. Interestingly this example is a custom order with Rosewood bridge, and a deep C neck profile rather than a V. Tonally it has a very complex sound, great depth and resonance, plenty of punch and attack, and well balanced with superbly articulated clarity - Quite simply it's a classic. The guitar comes in it’s original tweed hard case. NEW ARRIVAL This is a great example of the original size, bigger bodied Lowden, with the very unusual combination of Cedar top and Walnut back and sides. The first thing to mention is the look of the guitar, the Walnut looks exceptional, one of the most striking finishes I've seen on an acoustic. Tonally It has a warm, full sound, with great resonance and clarity, and the neck has a great feel and very easy playing action. As with all Lowdens it handles alternate tuning particularly well, and is equally happy being fingerpicked or strummed. At 7 years old it has already begun to mature, yet it looks practically unplayed. The guitar has a K and K pickup installed and comes in it’s original Hiscox flight case. SOLD In 1991, Richard Hoover collaborated with vintage experts to identify the most desirable qualities of the iconic Martin Pre-War D-18. 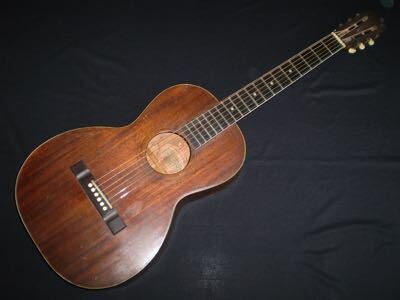 Doc Watson was one of the key contributors, chosen because of his appreciation of the clarity of Mahogany’s tone and his requirements for playability. He eventually went on to own the prototype which became known as the Vintage Artist - he said “This is the Dreadnought I’ve been looking for all my life.” The Santa Cruz Vintage Artist is THE instrument for those seeking that tone reminiscent of the most respected Pre-War guitars. To achieve the characteristic EQ and tone of the legendary Doc Watson, this instrument features an advanced, scalloped X-bracing for powerful bass, complimented by the clear tone and definition of master grade Mahogany. 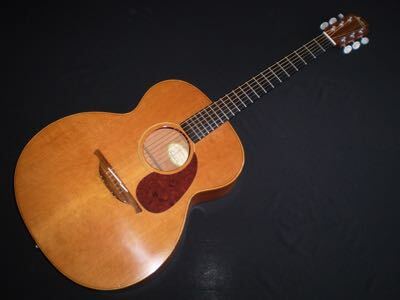 The guitar is in excellent condition and, with 24 years under it’s belt, has the maturity to produce the tone required to produce those wonderful deep, warm, smooth sounds. The guitar comes in it's original hard case. NEW ARRIVAL This is a great example of the original size, bigger bodied Lowden, with the classic combination of Cedar top and Mahogany back and sides. 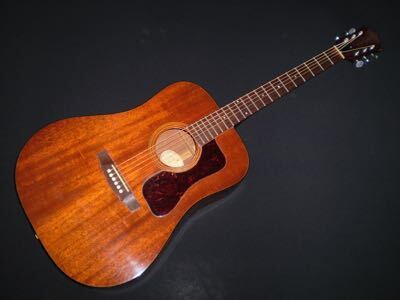 The first thing to mention is the look of the guitar - it has one of the darkest Cedar tops I’ve seen, suggesting a real maturity to it’s sound that you’d look for in a 26 year old guitar. Tonally It has a warm, full sound, with great resonance and clarity, and the neck has a great feel and very comfortable playing action. The guitar is in well played condition, with quite a lot of visible playwear on the top, which has just added to the maturity of tone, making it a very difficult guitar to put down. There is a small crack repair just below the neck valute, but as this is probably the strongest part of the guitar, it’s not an issue. As with all Lowdens it handles alternate tuning particularly well, and is equally happy being fingerpicked or strummed. It comes in it's original Lowden embossed Hiscox hard case. SOLD It's unusual for a guitar to be linked with one particular player, but the Guild M20 will always be considered the Nick Drake guitar. There are other small bodied, all Mahogany guitars out there such as a Martin 00-17 or a Gibson L-0 which are great, and have their own particular characteristics - but if you really want the Nick Drake sound then this is the real thing. Because of this, M20's don't turn up very often, and this one's a beauty. 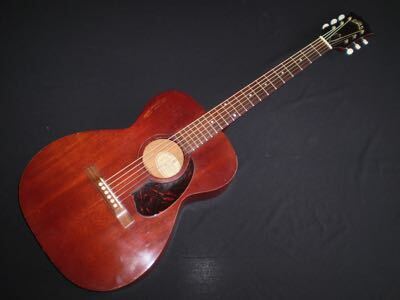 A 00 size guitar, all Mahogany, in great playing condition, with a comfortable neck and low action. The guitar sounds rich and warm, with a beautifully smooth bass and well balanced mids and trebles - it sounds great with delicate fingerstyle, very articulate when picked harder, and a surprisingly big sound when strummed. The guitar is in excellent all original condition with very little visible playwear for a 55 year old guitar. with no cracks or repairs, just one visible blemish above the soundhole. The guitar has a K and K pickup installed and comes in a non original hard case. 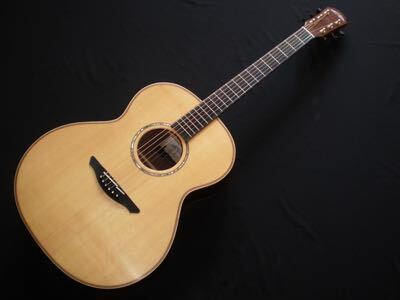 SOLD The Collings D2H is one of the most sought after, high end, hand built dreadnoughts around. This guitar has been expertly crafted, and offers not only a classic deign and all American tone, but boasts meticulous attention to detail creating a beautifully finished guitar. With a Sitka Spruce top and Indian Rosewood back and sides, it produces a full and powerful tone with exceptional low end performance, a balanced well defined mid range, and a full and clear high end. 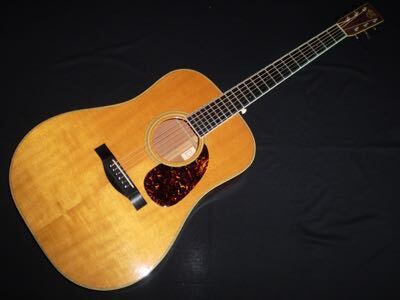 This guitar is everything you would want from this most classic of all time acoustic guitar designs. The soft V profile neck and low action make it a players dream, with a very responsive Ebony fingerboard. The guitar is in well played condition, with quite a few playwear marks, and features a very high end Mimesis Kudos Blend, which features a switchable combination of microphone and active/passive hum-cancelling magnetic pickup. The guitar comes in it’s original deluxe hard case. ON HOLD During 1991 Lowden changed their model names to the now familiar S, F and O. Prior to that the designated letter described the type of tone wood - in this case W for Walnut. This guitar would now be called an 0-23 as it’s the bigger bodied model, featuring a Cedar top with Walnut back and sides. It’s a very responsive guitar, capable of creating a big, orchestral sound with great detail, but also capable of subtle nuances while playing fingerstyle. In alternate tuning it really excels, drop the low E to a D and the floor starts to shake. The guitar in in excellent condition, the 30 years of play have allowed to tone to mature beautifully, and the playability is very comfortable. The guitar comes in it’s original Hiscox flight case. 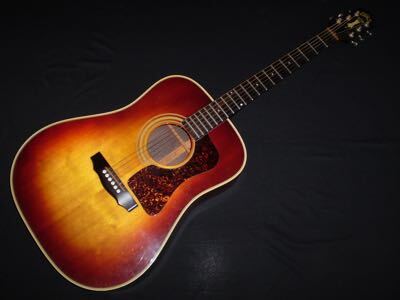 This is a great chance to buy a vintage US made Guild, at a price you wouldn't normally expect, made in the famous Westerly factory in Rhode Island. The Guild D25M is the model famously played by Ryan Adams, it's a dreadnought shape, with all solid Mahogany top, back and sides. The model later changed to a Spruce top that was stained Mahogany with and arched back, so this early example is wuite rare. Tonally it has rich, smooth, vibrant sound, good bass response yet very well balanced and it's hugely playable with a comfortable playing action. The guitar's in excellent condition, all original, with one repair by the end pin. The guitar comes in a non original hard case. SOLD Few electric guitars are as recognisable as a Gretsch, and in a classic orange finish the Nashville 6120 has to be the most identifiable of them all. 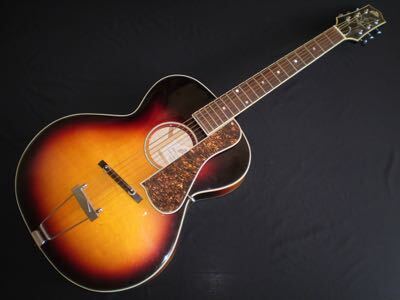 It first appeared in the mid-1950s with the endorsement of Chet Atkins, and was quickly adopted by rockabilly artists Eddie Cochran and Duane Eddy, then later by Eric Clapton, Pete Townsend, Brian Setzer, and many others. The guitar’s build quality is impressive, featuring 5 ply Maple body construction (not 3 ply on current models), a three piece rock Maple neck, Ebony fingerboard, neo-classical inlays, and open-bound oversized F holes. The hardwear features solid brass, gold plated control knobs, and Gretsch chrome Bigsby flat handle vibrato tailpiece. Then there are the dual high sensitive Filtertron adjustable pickups which deliver that signature Gretsch growl and midrange honk that takes you from rockabilly to hard rock and everything in-between. 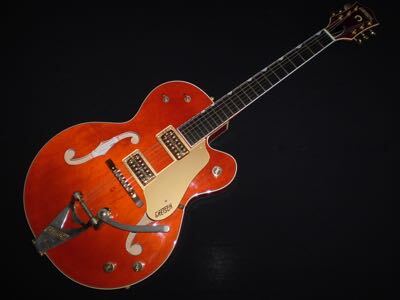 The guitar is in excellent condition, with a comfortable feeling neck and easy playing action., and comes in it’s original Gretsch embossed hard case with certificate and original paperwork. 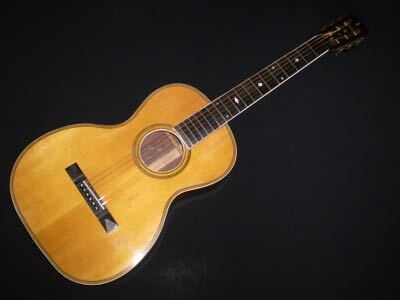 This is a rare example of a high end, Irish made acoustic guitar - clearly borrowing from the Maccaferri style Gypsy Jazz guitars with a D shape sound hole and extreme Florentine cutaway. The guitar features a 900 year old Sitka Spruce top, coupled with Indian Rosewood back and sides. The neck is African Mahogany with a Walnut strip, and a Rosewood fingerboard. The binding is Irish Yew and Herringbone, and the soundhole rosette is Abalone. The other noticeable feature of the guitar - and all Paul Doyle instruments - is a headstock finial featuring a white and pink pearl Celtic design. Tonally this guitar is very versatile, when fingerpicked the individual notes chime with great clarity, yet it strums equally well - the Sitka Spruce top adds punch and the Rosewood back and sides give added resonance. It's in good condition, with just signs of light playwear. It has an underside Artec pickup fitted, with controls mounted inside the soundhole, and comes in it’s original hard case. 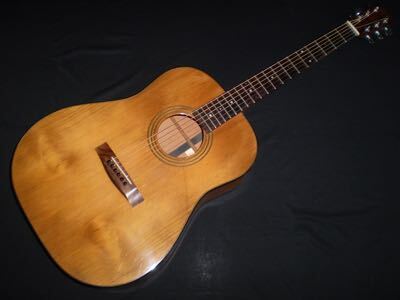 When Kazuo Yairi began designing and hand-crafting guitars in the 1960’s, he was not trying to create a “mid-range” alternative to the best American guitars; he was consciously competing with Martin, Gibson, Guild, and the “boutiques” for the higher end guitar market in the U.S. Since his death in 2014 his guitars have started to increase in value, and are becoming future collectables. 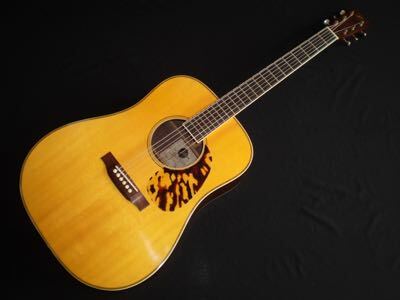 This DY-84 M model is an example of the quality and sound which he was able to produce using the highest quality materials, the best Japanese craftsmen, and his own modifications of the most effective American designs. The guitar has a Sitka Spruce top, with stunning Curly Maple back and sides, and a Mahogany neck. There’s a bound Rosewood fingerboard with beautiful Abalone snowflake inlays, an Ebony bridge, Abalone rosette, bone nut and saddle, gold tuners and a really striking Ebony headstock with Abalone inlays. A very classy looking guitar. Tonally the Maple particularly resonates around the mid and high frequencies, while the dreadnought body shape generates a great bass end. 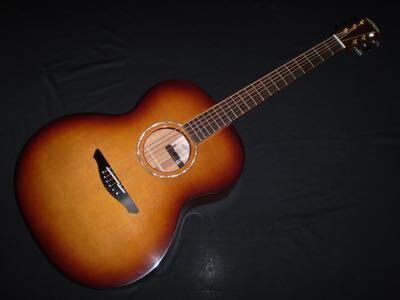 So the guitar is balanced, very dynamic and works well with both strumming and fingerstyle. It’s in excellent condition, with only minor signs of playwear, and comes in a non original hard case. 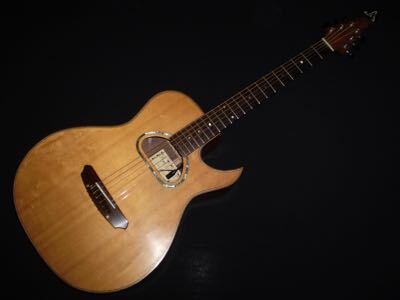 This Dan Armstrong London Guitar is a very rare thing indeed - only 333 guitars and basses were made. Probably better known for his Ampeg Plexi guitar which was famously played by the Rolling Stones in 1969, Dan used a very similar body shape for this wood bodied guitar. It features a Honduran Mahogany body, which is reminiscent of a ’50s Les Paul Jr.—Dan’s favorite guitar. The neck is also Honduran Mahogany, while the fretboard is Rosewood. The solid, fat Mahogany body gives the guitar a thick, raw sound much like a ’57 Les Paul Jr. The cast-aluminium wraparound bridge looks like a ’50s-style tailpiece, but is fully adjustable and is connected to an aluminium ramp running from the bridge to where the fretboard meets the body. The ramp houses a Kent Armstrong humbucker, which can be moved all the way from the bridge to the neck and anywhere in between. The guitars were wired so that when the tone control was all the way up, it would short-circuit half of the pickup, making it essentially a single-coil and brightening the sound beyond the 10-setting on the tone control. The low-impedance pickup uses a transformer housed in the guitar’s control cavity to adapt the signal to high impedance for use with an amp. To keep the pickup lean and mean, the Armstrongs created thin pickups by using 38-gauge wire. 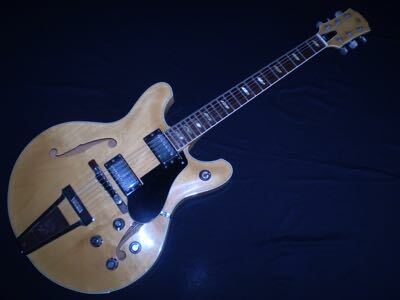 Altogether this is a very quirky guitar, in excellent condition with great playability and fantastic tone. It comes in a non original hard case. SOLD Santa Cruz are one of the best high end acoustic guitar builders, producing genuinely hand made guitars from California. The Tony Rice model is particularly hard to find, especially such an early example. The guitar is based on Tony Rice's 1935 Martin D28 with forward shifted skinny scalloped bracing, with Ebony fingerboard and bridge. It also features a custom Brazilian Rosewood headstock veneer and Santa Cruz logo fingerboard inlay at the twelfth fret adding to the guitar's high end feel. The guitar has incredible presence and bass response, yet retains a good balance with strong midrange and bright powerful treble response. The guitar works well with fingerstyle playing as well as powerful rhythm bass lines. It's seriously one of the best modern dreadnoughts you will ever play. It's in good condition, with a reasonable amount of playwear, and some finish flaking on the upper bout bass side. The guitar has an LR Baggs Anthem SL blend pickup system installed, and comes in it's original deluxe hard case. SOLD Larson Brothers guitars are amongst the rarest, most highly sought after acoustic guitars, and regarded as some of the best ever made. From 1900 - 1944 they manufactured instruments under a wide variety of names, such as Euphonon, Prarie State, Maurer, Stahl, Dyer and Stetson. They also produced quite a large number of guitars with no manufacturer's imprint - which can make them tricky to authenticate, but there are several signs to look for when trying to identify them, apart from the fact that they sound exceptionally good, and the build quality is superb. Externally, the variety of fingerboard inlays, the unusual 10th fret inlay, detailed binding, and a thicker than usual ebony fingerboard are indications. The internal structure is also a clue, the hand made feel and high quality is always apparent. This example is an 0 size guitar made with an extremely high quality, very tightly grained, Sitka Spruce top, and beautiful Brazilian Rosewood back and sides. For a small bodied guitar it is surprisingly versatile, very resonant and capable of handling anything from delicate fingerstyle through to vibrant strumming. The tone is rich and bright, and the Brazilian Rosewood back and sides add complexity to the overall sound - the single note clarity is particularly impressive. The guitar is in surprisingly good condition for a guitar of this age, with no cracks, and a very comfortable neck and playing action. It comes in a fitted hard case. Prices of Supro / National / Airline guitars are increasing steadily, possibly made more desirable because of Jack White / White Stripes. This 1956 Supro Belmont is in very good condition. With a peanut body, deep red finish, and gold hardware, the Belmont is as visually striking as it is tonally rich and dynamic. The oversized single coil pickup is powered by a large ceramic magnet, and the tone is quintessential Supro, with power, bark, and glassy shimmer when strummed with a pick. It doesn't get any simpler than a single pickup with Volume and Tone knobs, yet the Belmont makes the most of this basic layout and rolling off the tone knob gives you some very warm jazzy tones that are still defined and focused. There's plenty of twang and grit to be had too, giving an epic blues tone. The guitar is in all original condition, with excellent playability, just a couple of areas on the body edge where the plastic / vinyl finish is starting to lift. The guitar comes in what appears to be it’s original hard case. 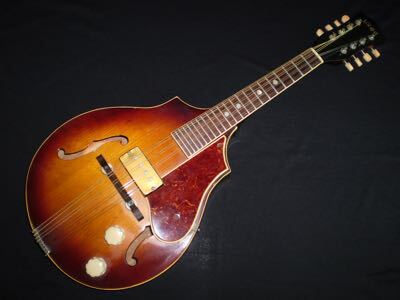 Vega were at the forefront of mandolin builders in the 1920’s and 1930’s, and amongst the earliest builders to experiment with electrification, employing some cutting edge features. This example features Vega’s trademark two-point shape, a great looking single coil pickup, and Bakelite tone and volume knobs, all of which add up to a very cool, classy looking instrument. Unplugged it sounds bright and resonant, and surprisingly loud despite the weight of the pickup and electronics. Plugged in the tone is full and ringing, and really cuts through. The instrument is in excellent condition, with an easy playing neck, and comes in a non original hard case. SOLD Over the last 20 years, Dave King has become one of the forerunners in British luthiery, all of his guitars have a genuine hand made feel, the tone and playability of which are superb. 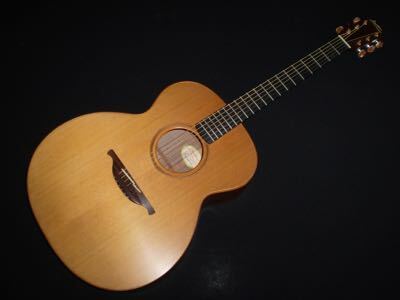 This example is a 12 fret 000 model, featuring a Sitka Spruce top with Indian Rosewood back and sides. The Spruce / Rosewood combination give great clarity and definition, and the body size gives fantastic balance. The resonance is probably the main thing you notice - single notes chime, and the sustain is really impressive. Overall it’s a great all rounder, very comfortable to play and even better to listen to. The guitar is in excellent condition, just the odd ding visible. It comes in it’s original Hiscox flight case. 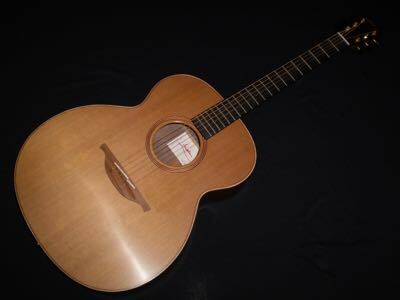 SOLD This is a rare example of a really high end, British made acoustic guitar. The Fylde Orsino is a dreadnought size, with select Western Red Cedar top and Honduras Mahogany back and sides. Tonally this guitar is very versatile, when fingerpicked the individual notes chime with great clarity, yet it strums equally well - the Cedar top adds warmth and the Mahogany gives depth. It's in very good condition, with just the kind of playwear you’d expect from a 28 year old guitar. It has an underside pickup fitted, and comes in a non original case. Marvit are a little known guitar company, based in Italy, producing high end electric guitars. 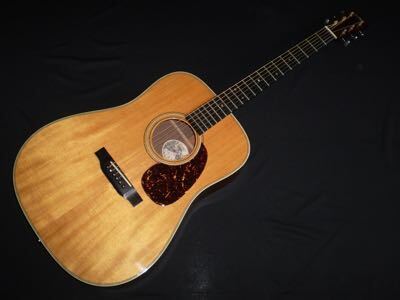 This particular example is a custom built Blues Limited Edition acoustic, hand made, using some very fineial indeed. The top is 8 year old AAA Sitka Spruce, with beautifully figured Syphian Mahogany back and sides. The Maple binding and Ebony fingerboard and tuners are an indication of the build quality, it even features an LR Baggs Ibeam system. The guitar is ideal for fingerstyle, with great single note separation and clarity, plus good sustain to handle strumming very well. The bass is warm, the mids full, and the trebles sweet - a very evenly balanced tone. The neck feels comfortable with easy playing action. It comes in it's original hard case. SOLD Not to be confused with modern Washburn guitars, the early 1900's models have become very desirable. The history may be a little confusing - but these early George Washburn guitars were made before the company was sold to Tonk Bros, and made by Regal. I’ve had a few of these early parlour guitars, but never one in all Mahogany, and tonally it’s quite different - much smoother and warmer than those with Spruce tops. The top and sides are in very good, crack free condition, although the back has had several repairs, and there is a neck repair. Having said that, the guitar feels strong, plays well and sounds really distinctive. It even comes in it’s original case. With the A1 10 Avalon have produced an exceptional example of a Cedar / Mahogany mini jumbo guitar. It’s a very versatile instrument, quite orchestral at times, this guitar can take you through all playing styles, subtle enough to play delicate fingerstyle, and rich enough to create a room filling sound. The single note clarity is exceptional, with bags of sustain, it really is a joy to play. Perfect for songwriting, studio use or out on stage. 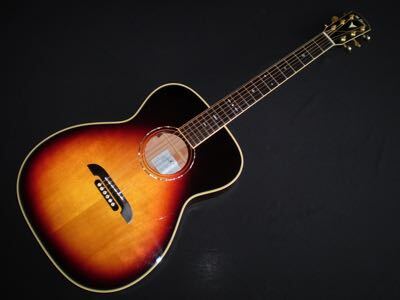 The custom sunburst finish is an added touch of class, making the guitar really distinctive looking. It comes in a Hiscox hard case. 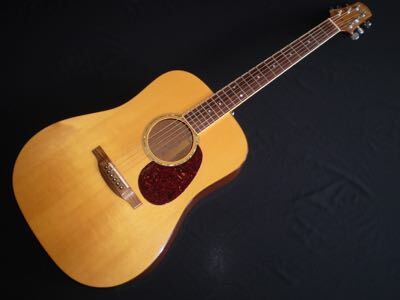 The D50 is probably Guild's best known dreadnought model, the classic Spruce / Rosewood combination, making it one of the most popular flatpicking / bluegrass acoustics around. This example is particularly desirable, as sunburst finishes are quite hard to find. The guitar has a fair amount of playwear, and has benefited from this with a more mature tone than you'd expect from a 30 year old guitar. It sounds resonant and punchy, with a full tone and great clarity and definition - very responsive, with a very comfortable playing action. It's a great looking guitar, the sunburst top is really striking, and the Rosewood back and sides are beautifully figured. 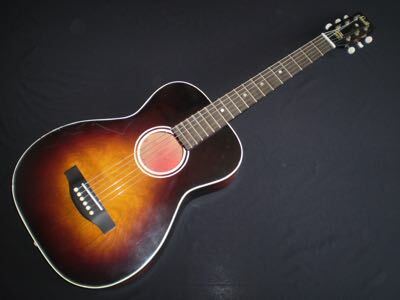 The guitar is in all original condition, with a very comfortable feeling playing action. It comes in it's original hard case. This is a real piece of British rock ’n’ roll history, from one of the most innovative / eccentric guitar designers. 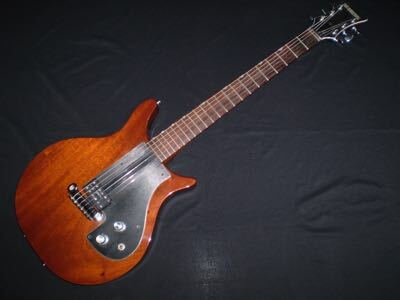 Jim Burns designed the Vibraslim to be the British equivalent of Gibson’s ES335 - a semi hollow, F holed electric guitar with a centre block, a glued in neck and humbucking pickups. 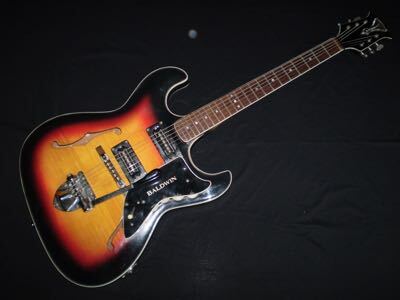 Baldwin re-engineered the Vibraslim in mid-1966 into a fully hollow guitar with a bolt-on neck, a short Rezo-Tube vibrato, and a scroll headstock. The later guitar was made in much greater numbers than this version, and are much more common today. 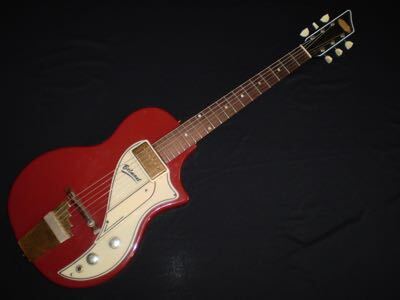 This Vibraslim is a rare combination of earlier instrument with the later ‘Bar-O-Matik’ pickups specific to the first half of 1966, and is a unique guitar both in sound and feel. This example is in great playing condition, with no cracks or repairs, just some cool looking lacquer checking. It’s a great example of a rare piece of history that’s not too valuable to take out on the road. It comes in a non original hard case. 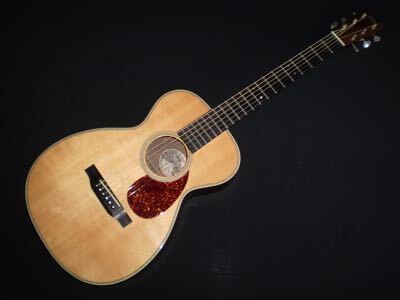 The 5 series is the first of Taylor's high end models - the beautiful rosette is an indication of this, understated but classy - and this guitar is a fine example. The Spruce top and Mahogany back and sides give the guitar a bright, airy feel, and the dreadnought body size gives great bass response and drive. 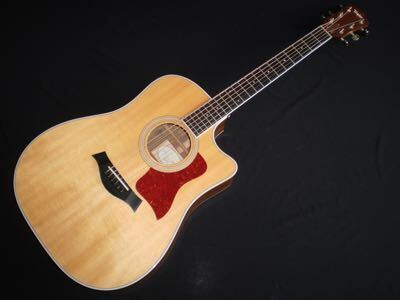 As with most Taylors, the neck is very comfortable with a great playing action. As a 16 year old guitar the tone has matured, adding a complexity to the sound - some very subtle overtones. The guitar is in great condition, with a very tight and well disguised neck repair. It comes in a luxury hard case. SOLD Stuart Mossman is considered by many to be the world’s first boutique guitar builder. During a relatively short period that began in the late 1960s and ended in 1984, he and a group of devoted artisans built high-quality acoustic guitars in Winfield, Kansas. Although exact numbers are hard to come by, it’s probably safe to say that the small Mossman shop produced only about 6,000 instruments during that time, which helps to explain why they are relatively rare and highly desirable in the used market. Similar to a Martin D-35, this Great Plains combines a beautiful three-piece Indian Rosewood back with a Sitka Spruce top. What this 3 piece back does for the sound is add more bass, as the 3 piece back is stronger that the traditional 2 piece back, allowing the top bracing to be lighter and therefore resonate more. It has a bright, punchy sound with plenty of attack, and a tight controlled bass, and with 41 years of play it has matured really well. It's in very good condition for it's age, the top having turned a beautiful honey colour, and the three piece back has beautifully contrasting Rosewood grain. It's in all original condition, with no cracks or repairs, just lots of great looking lacquer checking. It has a nicely bound ebony fingerboard which feels very comfortable, and has a great playing action. The guitar has a K and K Pure pickup installed, and comes in it’s original hard case. From up and coming Italian luthier, Raffaele Novelli, is this one off hand built guitar. 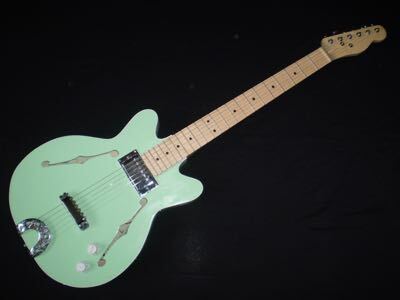 It’s reminiscent of a Fender Coronado, particularly with the classic Surf Green Nitro finish, although with a smaller body and set neck it also has the feel of a Gibson ES336. Made from 25 year old solid Spruce, with a solid Maple neck, the guitar also features a hardwired PAF style humbucker, and centre block to reduce feedback. There are some very distinctive finishing touches - a 30 year old chromed horseshoe tailpiece, and chrome rivets running along the rims. It has a played look to the finish, which only adds to the vintage vibe. The tone is warm, with a rich punch to the mids and a real snap in the trebles. The neck is very comfortable, with a low easy playing action. As a relatively new luthier on the scene, this could be a great chance to buy one of Raffaele’s guitars before they become expensive. The Vinaccia family are one of the most historically important stringed instrument makers, in fact many musicologists believe that the modern steel-strung mandolin was developed in Naples by the Vinaccia family. The earliest example on view was built in 1744 by Gaetano Vinaccia, and is housed in the Conservatoire Royal de Musique in Brussels, Belgium. There is a 1763 example by Giuseppe Vinaccia, which can be found at the Kenneth G. Fiske Museum of Musical Instruments in Claremont, California. A third example, built in 1772 by Antonio Vinaccia, is kept at the Victoria and Albert Museum in London. This lap steel guitar was built in 1932 by F.lli Vinaccia, and is one of only two known to exist - the other is in the National Museum of Musical Instruments in Rome. 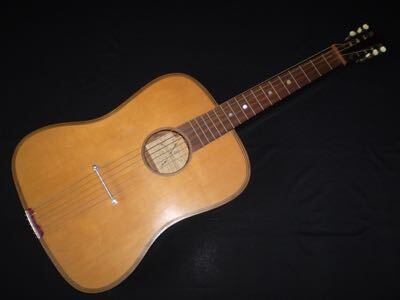 Based on the Weissenborn lap steel guitar, this is probably the earliest European made example. It has a solid Spruce top with Solid Mahogany back and sides. It’s in all original condition, with a couple of repaired back cracks. The guitar feels great to play, very light and resonant - the bass is round and not boomy, the midrange is smooth, and the trebles are bright and really project. The tone and vibe are vintage - no modern copy can come close to this. The guitar comes complete with a 30’s Elton tone bar, which is quite rare in itself. Even the guitar case appears to be original. Maybe this guitar should be in a museum, I’ll let the next owner decide.